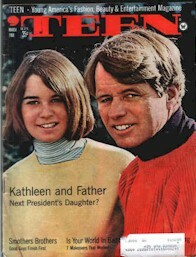 Teen Magazine cover image from March, 1968 depicting Robert Kennedy with his daughter Kathleen Kennedy. Image online, courtesy bapresley website. Bos, Carole "RFK and Kathleen Kennedy" AwesomeStories.com. Oct 07, 2013. Apr 23, 2019.